Published November 1, 2012. From Cook’s Illustrated. We prefer shredding the potatoes on the large holes of a box grater, but you can also use the large shredding disk of a food processor; cut the potatoes into 2-inch lengths first so you are left with short shreds. Serve with applesauce and sour cream. 1. Adjust oven rack to middle position, place rimmed baking sheet on rack, and heat oven to 200 degrees. Toss potatoes, onion, and 1 teaspoon salt in bowl. Place half of potato mixture in center of dish towel. Gather ends together and twist tightly to drain as much liquid as possible, reserving liquid in liquid measuring cup. Transfer drained potato mixture to second bowl and repeat process with remaining potato mixture. Set potato liquid aside and let stand so starch settles to bottom, at least 5 minutes. 2. Cover potato mixture and microwave until just warmed through but not hot, 1 to 2 minutes, stirring mixture with fork every 30 seconds. Spread potato mixture evenly over second rimmed baking sheet and let cool for 10 minutes. Don’t wash out bowl. 3. Pour off water from reserved potato liquid, leaving potato starch in measuring cup. Add eggs and stir until smooth. Return cooled potato mixture to bowl. Add parsley, 1/4 teaspoon pepper, and potato starch mixture and toss until evenly combined. 4. Set wire rack in clean rimmed baking sheet and line with triple layer of paper towels. Heat 1/4-inch depth of oil in 12-inch skillet over medium-high heat until shimmering but not smoking (350 degrees). Place 1/4-cup mound of potato mixture in oil and press with nonstick spatula into 1/3-inch-thick disk. Repeat until 5 latkes are in pan. Cook, adjusting heat so fat bubbles around latke edges, until golden brown on bottom, about 3 minutes. Turn and continue cooking until golden brown on second side, about 3 minutes longer. Drain on paper towels and transfer to baking sheet in oven. Repeat with remaining potato mixture, adding oil to maintain 1/4-inch depth and returning oil to 350 degrees between batches. Season with salt and pepper to taste, and serve immediately. 5. TO MAKE AHEAD: Cooled latkes can be covered loosely with plastic wrap and held at room temperature for up to 4 hours. Alternatively, they can be frozen on baking sheet until firm, transferred to zipper-lock bag, and frozen for up to 1 month. Reheat latkes in 375-degree oven until crisp and hot, 3 minutes per side for room-temperature latkes and 6 minutes per side for frozen latkes. For the fourth year in a row, the Montana Association of Jewish Communities (MAJCO) is sponsoring a Chanukah Menorot Lighting event with Lt. Governor Bohlinger. We hope to again have all nine communities of MAJCO light a Menorah (one each). This will be our last year lighting the candles with Lt. Governor Bohlinger as a new administration takes over in January. Let’s use this opportunity to come together as Montana Jews and celebrate the light that we all share. 12:00 p.m. Lighting Ceremony with Lt. Governor Bohlinger; Please arrive at 11:30 a.m. to set up. At 11:30 a.m., we will meet to setup tables, tablecloths, Menorot, signs, and any info you bring about your community. Each community should bring their own Menorah and candles. MAJCO will provide extra candles and Menorot if needed, small signs for each community, and a program that includes contact information for each community. Communities are welcome to bring Chanukah foods to share. MAJCO President, Josh Burnim, will welcome the crowd and introduce the Lt. Governor and the Rabbis. Rabbis Barbara Block, Chaim Bruk and Ed Stafman will speak on Chanukah. (Rabbi Allen Secher is not able to attend.) Lt. Governor Bohlinger will address the crowd. Then, we will all light our Menorot together and sing the blessings and Maoz Tzur. After the ceremony, we will share Sufganiyot and other Chanukah treats. The ceremony should only take 30 minutes, but we encourage all to spend some time before and afterwards with each other. At 1:00 p.m., MAJCO Officers and Delegates will meet upstairs for a business meeting. All are welcome to attend. EDITOR’S NOTE: Please note the change in date, time, and venue for the annual community Chanukah party. CHANUKAH: The first bulb of the Diane Kaplan Memorial Chanukiah will be lit on Saturday, 12/08/2012, at 5:30 P.M. at The Civic Center, as will each remaining bulb on all successive nights. The annual community Chanukah party will be held at the YWCA, 220 2nd Avenue North, on Sunday afternoon, 12/09/2012, at 2:30 P.M. We will adjourn at 5:00 P.M. or so and shift the party to the Civic Center to light the Channukiah. Please bring something yummy and milchig (dairy) to share, and a healthy hankering for latkes. PURIM: Sunday, February 24, 2013. Plans, if any, yet to be announced. PASSOVER SEDER: Tuesday, March 26, second night of Passover, at Clark and Lewie’s. STUDENT RABBI Miriam Farber returns to Great falls April 19-21; May 10-12. EDITOR’S NOTE: I received the following story from a congregant quite awhile back, and it intrigued me. So I Googled George Washington’s Chanukah and came up with quite a bit of information from Wikipedia — not just about this story, which has become part of American lore, but about how the Presidency and the White House have increasingly recognized Chanukah over the years. Although I know not everything you read in Wikipedia is true, the article I read seemed well sourced and at any rate was interesting to me. I encourage you to search it out yourself in the hopes that you might also find it interesting. Meanwhile, here is the story that originally sparked my curiosity. For centuries, the lights of the Hanukkah menorah have inspired hope and courage. They may have also been responsible for inspiring then-General George Washington to forge on when everything looked bleak when his cold and hungry Continental Army camped at Valley Forge in the winter of 1777/8. The story is told that Washington was walking among his troops when he saw one soldier sitting apart from the others, huddled over what looked like two tiny flames. Washington approached the soldier and asked him what he was doing. The soldier explained that he was a Jew and he had lit the candles to celebrate Hanukkah, the festival commemorating the miraculous victory of his people so many centuries ago over the tyranny of a much better equipped and more powerful enemy who had sought to deny them their freedom. The soldier then expressed his confidence that just as, with the help of God, the Jews of ancient times were ultimately victorious, so too would they be victorious in their just cause for freedom. Washington thanked the soldier and walked back to where the rest of the troops were camped, warmed by the inspiration of those little flames and the knowledge that miracles are possible. Different names have been suggested for the mysterious soldier, Jeremiah Greenman, Capt Isaac Levy, or Private Asher Pollock of the Second Rhode Island Battalion, all of whom were at Valley Forge. Stephen Krensky, in his lovely children’s book, “Hanukkah at Valley Forge,” traces the story back to a 1778 meeting Washington had at the home of Michael Hart, a Jewish merchant in Easton, Pa., which Hart’s daughter recorded in her diary, when Washington described his meeting with the Jewish soldier. For me, what is most interesting is that while Hanukkah falls at different times during the year, in 1777, the first night of Hanukkah fell on Dec. 24, Christmas Eve. Washington’s Continental Army arrived at Valley Forge just five days earlier, on Dec. 19. His choice of a site was sharply criticized. The troops were struggling to build enough huts before the men, barefoot and starving, died of exposure. Mutiny was in the air. One can only imagine what was going through General Washington’s mind as he walked among the troops that night of Christmas Eve. While some might question the veracity of the story, because the details of the Jewish soldier’s identity may be lost in time, here are its “truths: ” Like generations of Jews before him, that soldier served as a “light unto the nations” (Isaiah 42:6), bringing inspiration and courage to a nation in its birth pangs. And he did so in a perfectly American way, a way in which a miracle did result, the miracle by which the light from one religion helps give comfort and courage to another. It is just such religious tolerance and cooperation that the world needs so desperately today. “JFK? What does that mean?”, I asked. Kaila answered politely, “Just for Kiddush. Whether you come “JFK” or for some other reason, please come tonight for Shabbat services at 7:30 P.M. at The Bethel. Don’t forget the Torah study at 10:00 A.M. tomorrow morning and the milchig (dairy) potluck/adult discussion at 5:30 P.M. tomorrow evening. ONE OF OUR OWN … WINNING INTERNATIONAL SWIMMING COMPETITIONS AT AGE NINETY! 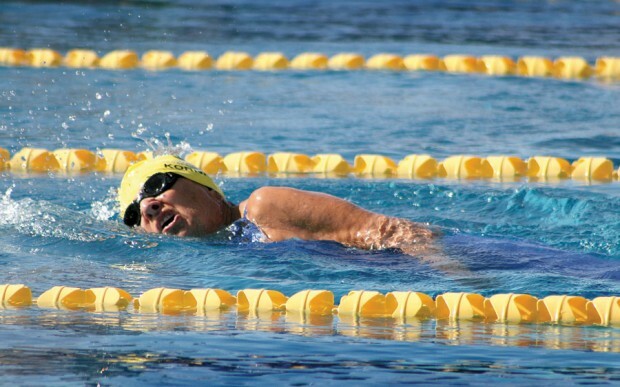 Maurine Kornfeld swims at the 2011 Mesa Spring Nationals in Mesa, Ariz. Kornfeld, 90, won five gold medals at the 14th FINA World Masters Championship in Riccione, Italy, in June. EDITOR’S NOTE: This article from the Missoulian was brought to my attention by Jerry Weissman. It is about Maureen Kornfeld, one of our former congregants who, at age ninety, is still winning swimming competitions. According to Jerry Weissman, a neighbor of the Kornfelds at the time, “Maureen was an early congregant of the Great Falls Jewish community in the 1930’s and has not forgotten her Great Falls roots. Actually, there were three children to the Kornfelds. Herb was a noted artist who left Great Falls to go to work for Walt Disney. Their brother Ray was an accountant in L.A. and led a quieter life. Here is the Missoulian’s story, with some fascinating history. Mazal Tov to Maureen Kornfeld. Once again, it is time to start thinking about signing up for shifts at the local Domestic Violence Shelter for Women (Mercy Home), so that the dedicated 24/7 staff there can spend Christmas with their families. To comply with the Mercy Homes rules, men are welcome to help cover a shift as long as they are accompanied by a female. For those of you who have never done this before, it is a great mitzvah to help out with the Mercy Home and the women who reside at the shelter. Duties include answering the phone (a script is provided, and an on-call staff member is available if you need help), monitoring the alarms, and signing residents in and out. Residents often stay with friends or family members during the holiday, so there may be only 1 or 2 residents on the premises — or none, so be sure to bring a good book to read or a movie to watch. If you are able to help, or have any questions, please contact Wendy Weissman at 727-4098 or wendy@weissman.com. The location of the shelter is confidential, so once I have the volunteer list, I will tell you where you need to be. In the days immediately following “Superstorm” Sandy, I watched from 3000 miles away as my Facebook and Twitter feeds exploded with New York-based friends and colleagues organizing volunteers, raising funds, and collecting donations to contribute to the relief effort. I sat in Los Angeles, feeling paralyzed by powerlessness, far from my East Coast home, yet in awe of those who leaped to help, even as they waited for power, heat, and water to return to their own homes. Does this need to be a zero sum equation? Do we need to decide between supporting the victims of disasters far away (or not so far away, for that matter) and supporting the disadvantaged in our own city? Rabbi Yossi offers us a Talmudic framework within which to make this decision (Talmud Bavli Nedarim 80b-81a). The limited resource at hand in Rabbi Yossi’s case is water, rather than donations. Rabbi Yossi rules that a town’s well is used first and foremost for the lives of the people of that town, then for the lives of strangers. His reasoning continues along this line: the town’s farm animals are watered before those of strangers and the town’s laundry is done before that of strangers. However, a stranger’s life takes precedence over the laundry of the town. Rabbi Yossi then contradicts himself, arguing that the laundry of the town comes before even the lives of strangers! It is clear from Rabbi Yossi’s argument with himself that the question of allocation of life-preserving resources has never had a simple and clear-cut solution. It is up to us to prioritize our giving, especially in times of extreme need. One organization, Uri L’Tzedek, an Orthodox social justice organization, quickly made such decisions in the days immediately following Sandy. Yael Keller relates the story of arriving in the Lower East Side of Manhattan with cases of bottled water. Immediately, residents eager for water, which had suddenly become a scarce resource in downtown Manhattan, surrounded the volunteers. However, this water had been designated for homebound seniors, whose mobility was even more severely limited as the loss of power stranded them on the upper floors of apartment buildings. When Yael and the other volunteers explained this, rather than the complaints they expected, the clamoring residents started shouting out the locations of stuck seniors. The response of those Lower East Side residents reminds us that there is an alternative to panicked greed in a time of crisis. They remind us to think of those who are even worse off, a difficult task indeed for those in a disaster area. There is enough to go around. Although as individuals, we may not have unlimited resources to donate to both long-term local needs as well as to immediate disaster relief; as a community, our resources are far greater. Perhaps we need to learn from the example of Uri L’Tzedek and all those engaged on the ground in relief work and practice radical generosity, giving all that we can, rather than the minimum to assuage our comfortable guilt. As a community and as a society, we have enough resources to ensure that all who need food, shelter, and water can access it. We need not get caught up in worrying about our laundry, when the lives of another city are at stake. Try out some radical generosity! The Union for Reform Judaism’s Hurricane Relief Fund and Uri L’Tzedek (indicate that it’s for relief efforts) are both doing great work on the ground in the areas most affected by Sandy. Friday evening, 11/16/2012: 7:30 P.M. Shabbat Services led by Student Rabbi Miriam Farber, at the Bethel. Oneg to follow. Saturday morning, 11/17/2012, 10:00 A.M. Torah study led by Student Rabbi Miriam Farber at The Bethel. Saturday evening, 11/17/2012, 5:30 P.M. Milchig (dairy) Potluck and Adult Discussion led by Student Rabbi Miriam Farber at the Bethel. Please bring a dish to share.